PSC Company/Corporation Assistant Exam Answer Key 5.08.2018, PSC Company/Board/corporation assistant Exam Answer Key download, PSC Answer Key of Company assistant exam 05.8.2018, brilliancecollege Company/Board/corporation assistant exam answer key. Kerala PSC Company/ Corporations / Board Assistant Exam will be held on August 5th (5-08-2018). Total 5 Lakhs of candidates had applied for the company / Corporation/ Board assistant post through PSC site. The Admit Card / hall ticket of Company/ Corporations / Board assistant exam will be available at www.keralapsc.gov.in. 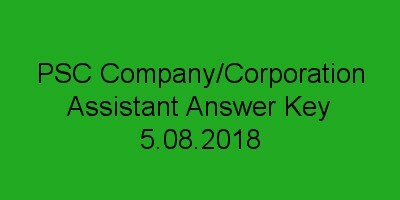 After the exam candidates can check their answer through Company/ Corporations / Board Assistant Exam Answer Key will be available at www.keralapsc.gov.in / www.brilliancecollege.com.